The most authoritative report on the persecution of Christians around the world has now been released for 2015. 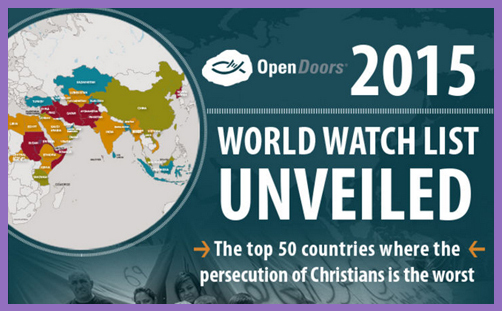 The widely respected Open Doors World Watch List is the only annual global survey of Christian religious freedom. Since its inception in 1993, it has helpfully ranked the 50 countries most hostile to Christian believers during the previous year. The systematic persecution of Christians in Iraq and Syria may have dominated recent media attention with the rapid rise of Islamic State, but the report reveals that oppression and violence have intensified in many countries. In fact, 2014 saw the greatest number of religious freedom violations against Christians worldwide in recent memory. Though violence against Christians made headlines throughout 2014, it was largely the same in most countries, with the exception of Iraq, Syria and Nigeria… Instead, pressure on Christians increased mostly in less obvious ways: being shunned by family; losing a job and rejection within the community for faith related reasons. Such “squeeze” tactics are especially hard on former Muslims who have embraced Christianity. The second most common driver of persecution was “dictatorial paranoia”‘ or “where leaders seek to control religious expression”. In North Korea, which has now held the top spot for 13 years continuously, it is illegal to be a Christian. Those who are discovered to be so are often sent to labour camps or summarily executed. This all makes for miserable reading for anyone who believes in the right to religious freedom. On current trends, 2015 will be even worse. In the face of persecution on this scale, neither ignorance not fear of offence can be an excuse for standing by on the other side in silence. That is why a year ago I warned against a misplaced sense of political correctness that had meant too many British politicians had forsaken speaking out against the evil that is anti-Christian persecution. Political correctness can never be an excuse for ignoring the cry of the suffering. The question is what more could or should be done? It is vitally important that governments in free societies do what they can to promote freedom of religion for believers of all faiths and none as a fundamental human right as set out in Article 18 of the Universal Declaration of Human Rights. It is also important to understand and recognise that Christianity is the most persecuted religion in the world and that much of this, as the World Watch List has repeatedly highlighted, comes through oppression in the name of Islam. You can’t talk with any authority on the subject of religious freedom without addressing this fact. The total figure for these countries is £2.722 billion, which equates to 59 per cent of the £4.636 billion given directly to individual countries. This is not an insignificant amount of money by any measure and it is a hard fact of life that funding buys you a place at the negotiating table. There is a limit, though, to how much aid can be used to deal with the complexities of religious belief and attitude, and if there is a lack of political stability in a country it may make very little difference. But in a few places it does provide options. The important thing is for avenues to be explored and for the resources available to be used effectively. Christians are of no greater importance than others, but nor are they of any less worth. When any group of people suffer for no good reason, pretending it isn’t happening is never the right or acceptable reaction. Ensuring that our politicians do not run away and hide from the issue must surely be one of the key priorities for churches and Christians in the build-up to the General Election. There will be plenty of opportunities through hustings and the like to do just that. One of the more immediate ways is to invite your MP to the parliamentary launch of the 2015 World Watch List in the House of Commons on the 20th January, which is being sponsored by Naomi Long MP. This event will highlight the dynamics of persecution and is a perfect opportunity to equip MPs with the information they need to engage meaningfully with the issue relating to religious freedom. Last week’s terrible events in Paris and the subsequent attendance of many world leaders at Sunday’s historic rally shows that we care deeply about the freedom to express our views and beliefs without fearing for our lives. Is it not too much to believe that those beyond our national borders deserve the same right?